Share this product and receive a $8.25 sharing discount. 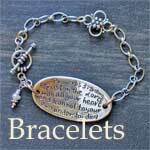 Words cannot really express the beauty of this handcasted and assembled bracelet with scripture. The materials are .925 Silver, a pearl (or garnet) adornment, and a few gold links. This popular mix of materials allows this bracelet to be worn with other silver or gold jewelry. This bracelet is available in 6 1/2", 7", and 7 1/2". The hand cast oval medallion measures 1 1/2" in length. If you need smaller or larger, please contact us. The artist is happy to accomodate by providing shorter and longer lengths. Please allow up to 3 weeks for special orders. 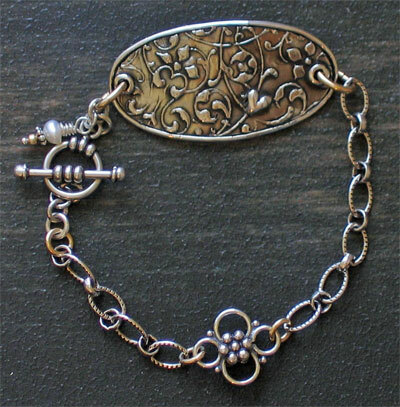 This particular bracelet has a lovely vine and flower design on the front of the bracelet along with one solitary heart. The backside of the medallion has Proverbs 3:5 cast into it, 'Trust in the Lord with all your heart and lean not to your own understanding; In all your ways acknowledge him, and he will make your paths straight.' A beautiful bracelet for young and old alike.